I have been a huge fan of PBS Learning Media since it’s Teacher Domain inception. This is the site has indexed top notch media to science topics and standards. Resources are easy to use, find and the perfect length to spice up any science presentation. 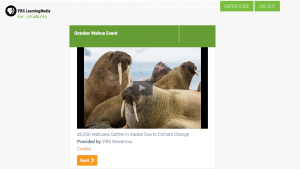 With the latest morph into PBS Learning Media, there are new tools including the ability to add questions to quizzes and track student viewing. PBS Rocks! Click here to learn about the Walrus Haul Out this fall. Use the code beetle697 to allow me to see your viewing responses and enter your participation in the grade book.